During the severe winter weather1 in Iowa we usually put out food for the birds, squirrels2, etc. It provides a source of nutrients3 for backyard animals which otherwise might not survive4 the cold and icy, snowy season. And, from our office windows we observe lots of interesting behavior5 as birds, squirrels, striped ground squirrels6, cats and occasional7dogs enter the backyard habitat8. Most of these are expected9 and fascinating10, some undesirable11 from our point of view12, but all related to survival of individual animals13. We have about half a dozen bird feeders with a variety of foods including suet14, sunflower seeds, cracked corn15, millet16 and other small grains. We also throw out ears of dried corn17, bread and cracker scraps18 and some vegetable scraps of carrots, celery and others which are left over from meals. There are about a dozen species of trees and shrubs19 and a small grape arbor20, all of which serve as perches21, and a compost pile22 where small fallen branches, leaves, etc. offer a variety of diversity23 for the dozen or so species of birds found at a given time. At a subtle24 level, some types of birds are more aggressive25 than others. Wrens26 are among the smallest birds present, but they are feisty27, and will drive away some larger birds from feeders. Starlings28, those messy “immigrants” from England will drive away most of the smaller birds from the suet feeders29, even the red headed woodpeckers30 who are about the same size. Bluejays31 often frighten away smaller birds from suet or grain so. Cardinals32, those brilliantly red residents, will drive off smaller birds if they want to, but not always. Black-capped chickadees33 show little animosity34 for other birds, and will feed along beside the mellower35 juncos36 and rose breasted grosbeaks37. Mourning doves38 usually arrive in groups of half a dozen or so, tend to show less aggression, and will feed from the ground below the seed feeders. Quail39 occasionally visit the area and the same is true of the occasional pheasant40 which come to the feeding area. Redwing blackbirds come from time to time, but seem to prefer the higher grasses near the athletic fields and near the wooded areas west of our yard. Each bird species, with its specific behavior, competes for survival41, and most do survive, though not perfectly. Cats, true to their predatory nature42, roam through the area, always looking for unaware birds. They also hunt the mice that feed under the bird feeders. Dogs, including our own Blitzen IV, will chase squirrels or rabbits, but seem more interested in the chase than in hurting the other animals. Squirrels in this area feed well on grains and are willing to feed side by side with most birds. They are voracious43 eaters, and most of them are very fat and quite playful at mid-winter. They can be seen hanging by their back legs, feeding upside down at a feeder, or from the ground. They are wary44 of the dogs, not much bothered by the cats, and probably consume more food than any other group of animals. They also bury corn kernels in the soil so that we see corn sprouting45 anywhere in the yard in the springtime. Perhaps most alarming is the activity of bird predators46 such as hawks47 and owls48. We have observed both small redtail hawks and sharp-shanked hawks enter our yard. When seen by other birds there is a rapid exodus49 of these prey species. The hawks swoop down50 swiftly from taller trees, sometimes catch an unaware bird, and either carry it off or kill and eat in on the spot. They will also prey upon mice, ground squirrels or small red squirrels. This is a natural phenomenon51, and certainly has had a role in survival and natural selection52 of prey species as well as predators, but it is not very pleasant to watch. Owls tend to feed in late evening, and apparently always carry the prey back to their nests to eat it. Each small behavioral distinction53 has a role in survival of bird species, and these behaviors are interesting to watch. They cause one to consider our own human behavior, and our impact on survival. 1. severe winter weather: unusually harsh, cold winter weather (恶劣的寒冬天气). 4. survive: continue to live normally in spite of many problems (活下来). 6. striped ground squirrels: small, striped rodents which live in holes in the ground (一种住在地洞里带条纹的小松鼠). 7. occasional: occurring now and then; at irregular or infrequent intervals (偶尔的). 8. habitat: the place in which a given population of animals lives (居住地). 9. expected: anticipated, or not surprising (预料得到的). 10. fascinating: of great interest, or enjoyable to watch (吸引人的). 11. some undesirable: some of these are undesirable, or not wanted (有些是不受欢迎的). 13. individual animals: single animals (一个个的动物). 14. suet: a mixture of fat and meat trimming from animals (一种动物脂肪和肉的混合物). 15. cracked corn: corn grains broken into large pieces to be used as animal food (包米碴子). 18. scraps: small pieces of some type of food material (碎片，小块). 20. grape arbor: a structure on which grape vines are grown (葡萄棚架). 21. perches: places where birds rest or sit temporarily (栖息之处). 22. compost pile: waste organic matter kept in a pile and allowed to decompose to form humus (堆肥堆). 23. diversity: a wide variety of types of something or some individuals (多样性). 24. subtle: obscure, or difficult to perceive or understand (细微的，难以察觉的). 25. aggressive: characterized by combative, assertive or fighting behavior (好斗的，咄咄逼人的). 26. wrens: small brown birds with a short tail that points upwards (鹪鹩). 27. feisty: often fussing, or scolding; or full of nervous energy (烦躁不安的，好争吵的，精力充沛的). 28. starlings: a type of gregarious blackbird which came to the U.S. from England, and which is now a pest species among birds (椋鸟，一种群居的黑鸟，由英国迁来，属于害鸟). 29. suet feeders: types of feeders providing fatty, meat products (放脂肪、肉食的食槽). 31. bluejays: a common large North American bird with blue feathers (蓝背樫鸟). 32. cardinals: a North American bird. The male is a bright red color (红衣凤头鸟). 34. animosity: the characteristic of showing displeasure with another type of animal; ill will or hostility. 35. mellower: more gentle and calmer (更温和的). 42. predatory nature: the quality of naturally preying upon another animal for animals for food (以捕食其他动物为生的特性). 43. voracious：gluttonous, eating large quantities of food, or rapidly eating (食量大的，贪食的). 44. wary: avoiding danger or threatening situations, cautious, prudent (谨慎的，小心翼翼的). 45. sprouting: growing out of the ground; beginning of plant growth (发芽). 46. predators: those animals who prey or feed on other animals (食肉动物). 49. exodus: movement out of or from an area, i.e. away from danger (离开，退出). 50. swoop down: fly rapidly toward the ground to attack or prey upon another animal (俯冲，猛扑). 51. natural phenomenon: an event which occurs naturally (自然现象). 52. natural selection: the process by which only plants and animals that are naturally favored for survival in their environment will continue to thrive and breed, while others will decrease in number or die out (物竞天择，自然选择). 53. distinction: a difference in one individual or species which sets it apart from others (区别). During the past week and a half it has turned quite cold, and our backyard bird feeders1 have become very busy with all types of birds feeding on the various types of seeds that Kim puts out for them. Some tiny, frail-looking2 little birds called black capped chickadees3 have also been feeding there. We have been interested in them for several years, wondering how they can even survive the often frigid temperatures4 which we can have in Iowa. Many other birds leave before the truly cold weather arrives, but the little chickadees stay, as do some of the much bigger birds5. Yesterday I found out about their survival techniques6 when I received my copy of NATIONAL WILDLIFE, a journal7 published by the National Wildlife Federation8, of which I am a member. An article written by a biologist who has spent over twenty-five years studying these tiny birds provided the answer for me. The chickadee survival involves9 several different things. During the warmer periods the bird carefully hides10 extra food items that it can use later. It also grows a dense winter coat of feathers11 and finds specially selected cavities12 in trees where it can roost13and be protected. Most interesting of all, the bird can control its body temperature14, lowering it at night in a controlled manner15 to about 12 to 15 degrees F below its normal daytime temperature of 108 degrees F. This allows the bird to conserve16 almost 25 percent of its hourly metabolic energy loss17 when the outside temperature is freezing or below. The lower the outside temperature, the more energy the bird conserves. We had noticed that the chickadees eat all day long at our bird feeders, and that is normal for them. I also found out that sunflower seeds18 are especially helpful for them, so I am glad that Kim already adds a lot of them to the mix of seeds she puts in the feeders. The squirrels19 also like the sunflower seeds. They have eaten a lot of them and they are especially fat this year. We all wonder how they can jump from branch to branch because they are so fat. However, they manage to do it anyway. They are so fat that when they are on the ground they almost look more like a rabbit20 or possum21 in size. I’ve heard of an old folk belief22 that if the little animals are especially fat that means a severe winter. If that is true, our squirrels are predicting a severe winter with their bulk23. We’ll wait and see. Meanwhile, it’s fun to watch our busy bird feeders. 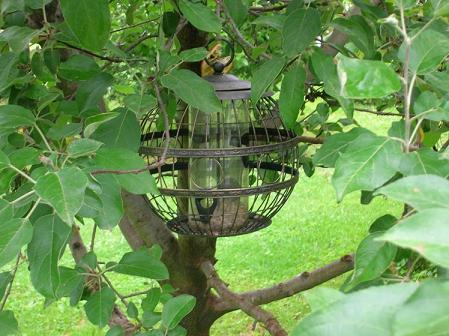 1. bird feeders: structures made to be placed outdoors, and which contain food offered to birds in the area (喂鸟的饲盘、饲槽). 2. frail-looking birds: small, weak looking, or thin birds (瘦小、稚弱的鸟). 3. chickadees: a type of bird which is found in North America in the autumn of the year (山雀，常见于北美洲的秋天). 4. survive the often frigid temperatures: stay alive and carry on normal behavior despite very cold temperatures (熬过经常有的极其寒冷的天气). 5. as do some of the much bigger birds: some of the much bigger birds stay too. 6. survival techniques: ways of surviving (幸存的技能) . 8. Nation Wildlife Federation: an organization which promotes the care of wild animals, and of their habitats (国家野生动物联合会). 10. hides: places items where they are not seen by other birds or animals (把……藏起来). 13. roost: rest from active movement; stay for periods of time, usually in a tree or elevated place (栖息). 15. in a controlled manner: in a way which is readily maintained or kept (可以掌控地). 16. conserve: keep or maintain a particular item or situation (保住，保留). 17. metabolic energy loss: the amount of energy that is derived from food, and which is lost to the environment (新陈代谢过程中的能量损耗). 18. sunflower seeds: the dried fruits of the sunflower plant (葵花子). 22. folk belief: a story that has been told so frequently that it is widely believed by people (民间、信念). 23. bulk: the large size, or the total weight (肥壮的身体). I believe that my Christmas cactus1 has an identity problem2. I just don’t know what it is. A Christmas cactus is supposed to bloom3 at Christmas time4, but mine has been blooming since before Halloween5. We have had it in our sunroom6 for about ten years now, and each year it has been blooming a little earlier. At this rate, the blooms will all be gone before Christmas. 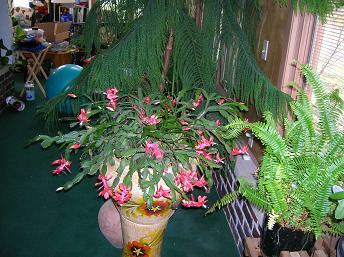 My Christmas cactus has beautiful bright pink blossoms7. It brightens things up considerably8. Perhaps it realizes9 we don’t really need it to bloom at Christmas time anyway, because then we always have some beautiful red poinsettias10. We can always count on11 receiving a poinsettia or two as gifts each year, usually from people who don’t know what else to give us and know that flowers (and books) are always welcome at our house. I can remember that I was surprised a few years ago when I realized that our Christmas cactus was blooming a month early, at Thanksgiving time12. I’m no longer surprised. It will do whatever it wants and we’ll enjoy it no matter when it blooms. I guess we can use some extra brightness as we see the leaves fall from the trees in our yard. Also it’s not just for our enjoyment alone. We keep it just inside our front entry way13 so that people can step from the bleakness14 of the outside these days and enjoy the beauty of our sunroom. Don just told me that he knows why our Christmas cactus blooms at Thanksgiving time. Don says he has taken care of this plant every week for all these years, and it blooms at the time it does because this is the time of his birthday, and the plant is doing this for a birthday celebration15! 1. Christmas cactus: a branching, flat stemmed plant native to Brazil, which produces bright showy flowers of red, pink, white or violet, and produces these flowers about Christmas time in the northern hemisphere (蟹爪仙人掌，原产于巴西，花开十分鲜艳，有红色，粉色，或紫色，在北半球大约在圣诞节期间开花). 2. identity problem: difficulty in knowing what it is and what it is supposed to do (身份问题). 3. bloom: produce flowers as part of the plant’s life cycle (开花). 4. Christmas time: about December 25 of each year (圣诞期间). 5. Halloween: a holiday celebrated on October 31 in the U.S. (万圣节前夕). 6. sunroom: a room of a house which has many windows to permit growth of plants and give sunny exposure to the room (阳光房). 7. blossoms: a synonym for blooms, the showy flower parts of a plant (花). 8. considerably: a large amount, or by a great deal (相当程度地). 9. realizes: knows or understands (意识到). This is an anthropocentric use of the word, because we believe that plants do not have the ability to know or think since they have no nervous system. 10. poinsettia: the name of a plant of tropical origin which has scarlet, pink or white leaves which look like blossoms surrounding the small, inconspicuous flowers (一品红，一种热带植物，围绕着不太显眼的小花周围，有一些红色，粉色或白色的看上去像花一样的叶子。). In North America this is traditionally used to celebrate the Christmas season. 11. count on: rely on; expect it to happen (依赖，指望). 12. Thanksgiving time: around the last week in November (感恩节期间，大约为十一月的最后一周). 13. front entry way: the area near the front door of the sunroom (阳光房前门进来的地方). This winter was a particularly1 snowy, cold and stormy one in which ice and snow gathered on tree branches and caused many of these to break off and fall to the ground. In addition, there were many leaves on the ground that had fallen during the early winter, along with small branches which died and fell from trees and bushes. One of the yearly chores2 that must be done by a home owner is to clean up the dead leaves and branches, and to dispose of them in accordance with the laws of the city3. In the countryside wooded areas producing fallen limbs such as these are often just left to decay4 on the ground under the trees, but in home yards this waste material5 is not considered attractive, and actually prevents the grass from growing well to form the green lawns which most home owners would like to have. In earlier times in the U.S. it was possible to pile up all of this waste and to burn it in the spring or fall. However, now most cities, including Pella where we live, require the homeowner to dispose of6 this material without burning. Burning puts lots of smelly smoke into the air, bothering some people who have difficulty breathing, and which pollutes7 the air with “greenhouse gases8” which are a factor9 in air pollution and global warming10. For small branches and leaves we usually rake them into piles, carry them to our “compost pile11” where we allow them to decay and to produce humus12, an important organic material containing part of fertile soil. We later take the thoroughly decayed material and use it to help feed flowers and garden crops. It is actually very important to maintain fertile soil, and it replaces the need to put commercial products to supply nutrients13 to the lawn. We also pulverize14 some of the leaves on the yard with the lawn mower15 so that the small pieces serve as natural fertilizer16 to the lawn. I have already done that job this spring. For larger branches we have several choices. We may cut the smaller diameter17 branches into bundles18 no more than 4 ft. in length and put these out near the street for the city waste disposal trucks to take to the city landfill19, or perhaps to be ground to chips20 and used by the city for placing around trees and bushes. The larger diameter branches we may wish to cut into shorter lengths to be burned in our fireplaces21 when they are dry; or, if we have no wood-burning fireplace, we may use it for campfire22 fuel during the summer. If we do not wish to do this, we may hire professional workers who take care of trees to bring their large equipment which can grind23 even large branches into small chips of wood which can then be used to put around in landscaping24 of gardens, or for large composting operations. When I was growing up, one of our regular chores was to pick up all of the limbs that fell from trees, or which we trimmed from trees, and pile these in the back of our yard where we would let them dry for a while, and then cut them to be used for wood burning stoves which we had in our home. So, there is some nostalgia25 involved when I clean up fallen branches from our yard. It brings back memories of sawing26 and using an axe27 to provide the fuel which we used to heat our home. Now few city dwellers produce their own wood for fuel. One can purchase it from people who harvest and cut wood for burning in home fireplaces or wood burning stoves. 1. particularly: unusually or especially (特别，尤其). 2. chores: small jobs which need to be done around a home or office (日常零星工作). 4. decay: decomposition of organic matter (腐烂). 5. waste material: material which is not useful unless changed for another purpose (没用的东西). 6. to dispose of: to get rid of, to throw away (处置，处理). 7. pollutes: makes the environment bad (污染). 11. compost pile: a pile of organic wastes such as plant or animal items which can decompose to produce a usable material for use by other plants (堆肥堆). 12. humus: the brown or black organic material along with some solids which results from the partial decay of plant wastes or animal wastes (腐殖质). 14. pulverize: grind to a fine powder or small pieces (研磨，使成粉末). 16. fertilizer: material which can be used as food nutrient for plants (肥料). 22. campfire: a fire lit in a camping area (营火). 23. grind: reduce to very small pieces with a machine or with stones, etc. (磨碎，碾碎). 25. nostalgia: remembering earlier events of one’s life, often pleasant or emotional experiences (怀旧). Today I plan to buy a big bag of unshelled peanuts1 and perhaps a bag of dried field corn on the cob2 I’ll use those for feeding animals, not elephants3 in the Des Moines zoo4, but the squirrels5 in our back yard. I love watching the squirrels as they zip up and down our trees6. The other day Don put a bucket7 of stale8 peanuts up in our crab apple9 tree. I wondered if the squirrels would find the peanuts there, but of course they did10. I looked out to see a bushy tail sticking out of the bucket11. Soon out came the whole squirrel who sat up on a limb eating the peanuts and spitting out the shells12. The space below the tree is littered with peanut shells by now13. Don says that the squirrels also were trying to bury14 the peanuts in our strawberry bed15. Who knows? We may have a mixture of strawberry and peanut plants next year. Stranger things have happened. We have had some “volunteer” corn16 come up from corn grains17 the squirrels have buried. We’ll also be buying a big bag of bird seed18. Feeding the birds is Kim’s project19. As soon as fall comes she starts thinking about how the birds will find food for the winter, so she makes sure they do20. The squirrels also eat the bird seed out of the bird feeders21, and that irritates22 Kim because she intends it for the birds. In addition, both birds and squirrels spill23 enough seeds, peanuts, and corn for the rabbits and occasional raccoons24 and possums25 to eat. As, I said in the beginning, we do feed the animals that visit our yard. We just don’t see the possums and raccoons often because they visit us at night. Some of our friends have deer26 visit their yards regularly. We don’t, probably because our dog Blitz barks at them and frightens them away. The squirrels know she can’t catch them even if she chases them because we have lots of trees for them to climb. The squirrels also know that our neighbors two houses down have a big walnut tree27. The walnuts are falling now so we also see squirrels running through our yard with big green-husked walnuts28 stuffed in their cheeks29. All in all, Central Drive30 is a good place for both people and animals. 6. zip up and down our trees: move rapidly or speedily up and down the trees (在我们家的树丛中飞快地上穿下跳). 8. stale: no longer fresh so are not good for humans to eat (不新鲜的). 9. crab apple tree: a variety of apple tree which forms very small, sour, apple fruits, and which is often grown for the beauty of the flowers in early spring (沙果树，苹果树的变种，果子很小有酸味，早春开花，很美，常因花美而养树。). 10. they did: they found the peanuts there. 14. bury: cover with soil (掩埋). 15. strawberry bed: a special place where strawberry plants grow to produce fruit in the spring (种植草莓的苗床). 16. volunteer corn: corn plants that are not planted by a person, but which are from seeds buried by squirrels, or come from seeds which were dropped from plants and land in fertile soil (自己长出来的玉米). 19. project: a specific job done by a person (项目). 20. she makes sure they do: she makes sure they find food for the winter. 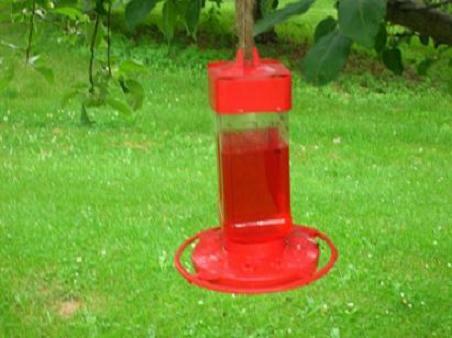 21. bird feeders: structures into which bird seed may be placed to feed birds in one’s yard (喂鸟的容器). 22. irritates: makes one unhappy or angry (惹人生气). 23. spill v. to drop accidentally from a container, bucket, bag, dish etc. 24. raccoons (浣熊): medium mammals living in the wild, chiefly gray in color with a black face mask and rings of dark fur on the tail. These often feed at night and from gardens, eat garbage or other food thrown out in the yards. Yesterday our local tree trimmer/remover1 came out to look at our old elm tree2 that was so badly damaged during the ice storm3. After carefully looking up at its high branches4, its solid big trunk5 etc., he had good news for us. He said he thought we needn’t have it removed after all. We had been afraid that a strong wind would make it fall either on our house or on the power lines6, but he said the trunk was still so strong that we really needn’t worry about it. We were delighted7! Knowing that he was coming and expecting8 to lose the tree, I had been thinking a lot about what kind of tree to plant to replace the old one. Should it be an oak9, the Iowa state tree10? Should it be another colorful maple11? Maybe both. No matter which, we definitely12 would plant at least one tree there. We love both the beauty and utility13 of trees. This morning’s Des Moines paper14 provided us with some interesting news. We read that the Des Moines city zoo has invited Democratic and Republican presidential candidates15 to plant a “tree park16” at the zoo, made up of oak trees. The oak trees were purchased by the zoo and grown by students at one of the high schools. Each tree will have a plaque17 bearing18 the name of the candidate and the date it was planted. The project was announced to coincide19 with Earth Day20. At the present time the zoo is awaiting official responses21 from the candidates. I believe that many of us Iowans22 will be interested in knowing which candidates are willing23 to take the time away from politics24 to plant a tree and which candidates fail to do25 so. I certainly will not vote for a candidate who refuses to plant a tree. We’ll all know because the newspaper will keep us informed26. 1. tree trimmer/remover: a person who earns a living by cutting down and removing trees, trimming branches, and cleaning up waste wood after the trimming (整枝和清理树木的工人). 5. trunk: the main stem of the tree which supports the branches, etc. (树干). 6. power lines: wires carrying electricity which are mounted on tall posts (输电线). 7. delighted: very happy or joyful because of a given incident or some information (很高兴). 8. expecting: thinking something will happen (期盼、期待). 9. oak: a large shade tree which is part of the native forests of temperate regions around the world (橡树，是温带地区原始生长的树种，可以提供很大的树荫). Oak wood was used in construction, and in furniture where hard wood is preferred. 11. maple: a large shade tree found in the temperate regions of the world (枫树，生长于温带地区). Wood from the maple is often used for flooring or furniture. 12. definitely: certainly; without doubt (肯定，毫无疑问). 13. utility: usefulness of something or somebody (实用性). 15. Democratic and Republican presidential candidates: individuals of the two major political parties who are competing for the office of the president of the United States (美国两大政党民主党和共和党的总统候选人). 16. tree park: a plot of ground in which trees are placed to be enjoyed by the general public (植树的园地). 17. plaque (标示牌): a flat sign, usually of metal or other weather resistant material, with a commemorative description telling about the object on which it is placed. 18. bearing: having or carrying (有、记载着). 19. coincide: happen at the same time (同时发生). 20. Earth Day: a day in the spring set aside to show respect for and care of the Earth (地球日). 21. responses: answers to questions or actions (回音、回答). 25. fail to do something: leave something undone, or unaccomplished (没法做某事). You are currently browsing the archives for the Yard and Garden category.